SS1 Harju 1 (2.31 km) 1:49.5 12. 12. WRC 75.9 2.34 1:49.5 12. "A clean run but nothing else. Careful in many braking places but hopefully we didn't lose more than two or three seconds." SS2 Halinen 1 (7.65 km) 3:39.7 1. 1. WRC 125.4 5:29.2 8. "That's good but still the race is really tight. I need to improve my driving. I think I can improve." / "Výhra potěší, ale soutěž bude těsná. Musím se zlepšit, jde to." SS3 Urria 1 (12.75 km) 5:56.8 3. 3. WRC 128.6 0.03 11:26.0 5. "I'm having fun with this extremely quick car on these roads. I hope I can learn a lot more this week." / "Je to nádhera jet s tímhle autem na těchto tratích. Doufám, že se mohu hodně naučit." SS4 Jukojärvi 1 (21.31 km) 10:12.7 4. 4. WRC 125.2 0.30 21:38.7 4. "A bit careful because many drivers had problems and broke their cars here. I drove carefully." / "Jel jsem opatrněji, protože pár jezdců tu rozbilo auta." SS5 Halinen 2 (7.65 km) 3:37.2 4. 4. WRC 126.8 0.09 25:15.9 4. "A few cuts in here, but you have to do that to be fast. At the moment I can be happy, although I'm still disappointed about last night's city stage." / "Celkově zatím mohu být spokojen, jen mě mrzí ta městská speciálka." SS6 Urria 2 (12.75 km) 5:53.1 7. 7. WRC 130.0 0.27 31:09.0 4. SS7 Jukojärvi 2 (21.31 km) 10:02.8 5. 5. WRC 127.3 0.26 41:11.8 5. "A lot of rain at the beginning and at the end. In places it was difficult to see, only 100 or 150 metres in sixth gear is not good." / "Na začátku a na konci hodně pršelo. Místy bylo vidět jen na 100 metrů, což na vytočenou šestku není moc." SS8 Äänekoski - Valtra 1 (7.39 km) 3:27.4 1. 1. WRC 128.3 44:39.2 3. "That's good because it was difficult in the rain. Three Finns in the top-three is good but there's a long way to go." / "Bylo to těžké v dešti. Ale Finové nahoře, to je dobré." SS9 Laukaa 1 (11.76 km) 5:53.4 3. 3. WRC 119.8 0.20 50:32.6 3. "Pretty happy. No big issues, just braking too early in a few junctions. But still the time is okay." / "Docela spokojen. Jen jsem místy brzdil moc brzy." SS10 Lankamaa (21.68 km) 10:22.1 2. 2. WRC 125.5 0.03 1:00:54.7 3. SS11 Äänekoski - Valtra 2 (7.39 km) 3:23.8 2. 2. WRC 130.5 0.05 1:04:18.5 3. "It's going well but this rally is difficult and it is easy to make a mistake as we have seen with many drivers today." / "Je hrozně lehké udělat chybu, jak jsme to dnes viděli u mnoha jezdců." SS12 Laukaa 2 (11.76 km) 5:48.8 5. 5. WRC 121.4 0.33 1:10:07.3 3. "Not so good, a few mistakes. I was sliding a lot. I was not on the limits but I lost the rear a few times." / "Udělal jsem pár chybiček, když mně moc utekl zadek." SS13 Harju 2 (2.31 km) 1:48.1 6. 6. WRC 76.9 0.52 1:11:55.4 3. SS14 Pihlajakoski 1 (14.90 km) 6:57.1 3. 3. WRC 128.6 0.21 1:18:52.5 3. 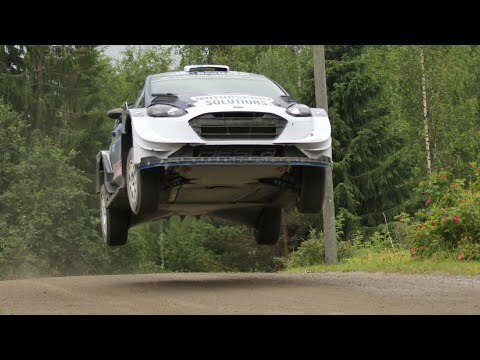 "Stage was really nice I enjoyed the drive but I lost a few seconds. I could push a bit more." / "Zkouška je moc hezká, ale nechal jsem tam pár vteřin, musím přidat." SS15 Päijälä 1 (22.68 km) 11:02.2 5. 5. WRC 123.3 0.30 1:29:54.7 3. SS16 Ouninpohja 1 (24.38 km) 11:30.5 9. 9. WRC 127.1 1.38 1:41:25.2 4. "I missed a chicane, I needed to turn around. Lost maybe 20 seconds. Not a good run." / "Minul jsem retardér a musel se vracet, nechal jsem tam tak 20 vteřin." SS17 Saalahti 1 (4.21 km) 1:59.5 4. 4. WRC 126.8 0.26 1:43:24.7 4. SS18 Saalahti 2 (4.21 km) 1:57.4 3. 3. WRC 129.1 0.24 1:45:22.1 4. "An okay stage. Still I could find a few tenths but it's difficult to go faster." Can you get third place back? "If I continue like this and try to avoid mistakes it should be fine." SS19 Ouninpohja 2 (24.38 km) 10:56.5 5. 5. WRC 133.7 0.27 1:56:18.6 3. "I am so sorry for Jari-Matti. He had done such a good job here." / "Je mně líto JML, jel neskutečně." SS20 Pihlajakoski 2 (14.90 km) 6:49.0 1. 1. WRC 131.1 2:03:07.6 2. "A good stage. No moments, no mistakes. Basically a clean run. Second place is cool, but I must keep focused on the driving. It's a tight fight." SS21 Päijälä 2 (22.68 km) 10:44.2 3. 3. WRC 126.7 0.08 2:13:51.8 2. "Okay. One small jump in here where I went a bit wide. Not a big issue. I got away with it. Now I just need to continue like this." SS22 Lempää 1 (6.80 km) 3:13.8 8. 8. WRC 126.3 0.79 2:17:05.6 2. "That was a bad morning for us. I was struggling with the grip all the time. I don't know. Need to find something for the next stage." / "Měl jsem celou dobu prblém s gripem." SS23 Oittila 1 (10.12 km) 4:55.3 2. 2. WRC 123.4 0.32 2:22:00.9 2. "What have I changed? It's a secret. I can't say because we are in a tight fight." SS24 Lempää 2 (6.80 km) 3:27.6 21. 21. WRC 117.9 2.84 2:25:28.5 4. "I tried. I spun. That's all." / "Zkusil jsem to a udělal hodiny, to je vše." SS25 Oittila 2 [Power Stage] (10.12 km) 4:59.9 11. 11. 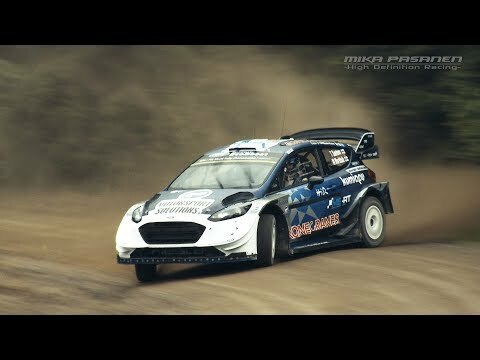 WRC 121.5 1.12 2:30:28.4 4. "Difficult to say anything. The rally was really good, the pace was good - better than any of us expected - and I was in second. Then two mistakes and now we are fourth. Now I feel disappointed but tomorrow the feeling will be better. On my second rally in this car I was fighting for a podium." / "Tempo jsme měli lepší, než se od nás čekalo a jel jsem druhý. Pak jsem udělal dvě chyby a jsme čtvrtí."